You need to be pretty fit and prepared for a tough summit day! For groups of 2 or more The Machame or 'Whiskey' route as it is sometimes known has the advantage of spending some time in the beautiful rain-forest, then leading up to the moorlands of the Shira Plateau. The path then traverses below the southern ice fieldsof Kibo. It is scenically one of the best. Please be advised that you are travelling to a completely different part of the world! This may sound obvious but it is surprising how many people are taken aback by the differences in culture. Local standards are a contrast to those in the Western World, you should be prepared for this and be happy to accept the differences. The standard of vehicles on the roads is lower, the standard of driving is lower, the hotels have different set-ups, etc. These differences also extend to the mountain, local guides are trained to a different standard than Western leaders, food and water hygiene is different. Our leaders will advise you of what to do and what not to do to help you adjust as easily and painlessly as possible. You should, as much as possible, try and enjoy the differences in cultures that exist because this is one of the things that make travel so interesting! This trek visits high altitudes! It is imperative you are properly acclimatised not only in order for you to have a safe trek but also an enjoyable one as altitude sickness has the capacity to make you feel very miserable! All along the way you will find warnings about ascending too quickly, if you show signs of altitude sickness appropriate measures (i.e. descent) must be taken. Inform yourself as much as possible about this issue before you travel in order to have an understanding of how you may be affected. Keep your guide informed regarding how you are feeling during the trek. The climate during your trip will vary between hot in Moshi (25-35C), to relatively warm on the lower trekking trails (15-25C daytime) to cold at the higher elevations (0-5C daytime). 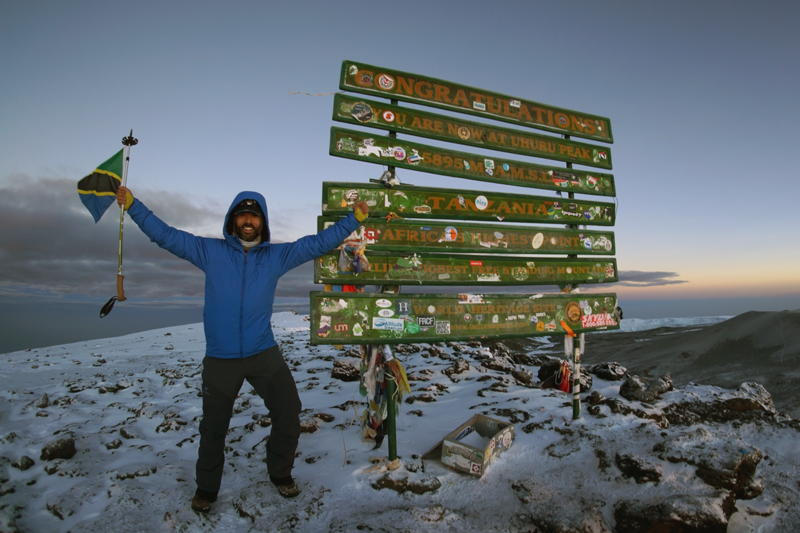 Temperatures at Meru and Kilimanjaro summit can be as low as -25C with snow. You must be prepared to encounter low temperatures. This is particularly relevant when deciding upon which equipment to take. This should be of good quality. A Valid Passport: Your passport will need to be valid for at least 6 months after your return date. Please bring a photocopy of your passport with you for Kilimanjaro Park Permits. Relevant Vaccinations and where necessary Malaria tablets: For medical and inoculations advice, contact your local GP and visit the Foreign & Commonwealth Office website before you travel. Do this in good time (at least 3 months) as many injections/treatments must be given a certain time apart. Entry Visa:All British nationals require a visa for entry into Tanzania. You need to arrange these prior to departure. Feel free to use this Visa Portal for your convenience. If you are not a British national then you will also need to contact the embassy to enquire about visa requirements. Relevant travel Insurance: You will need to make sure your insurance includes an element of trekking up to 6000 metres. Feel free to visit Travel and General for your convenience. A typical day on the trek starts with a wake-up call at about 6:30am depending upon what your activity will be for the day. Breakfast at 7:30 - 8:00am followed by trekking start at 8:30am. You can stop for tea during the morning and probably break for lunch at about midday. If you need to walk in the afternoon then you will generally be at your day's destination by about 3:00 - 4:00pm. Evening meal will be served at approximately 6:00pm before an early bed time. These times are flexible but the rhythm is dictated by daylight and you will need a lot of sleep. Arrival Day: Our services start: Arrive at Kilimanjaro International airport where you will be met and transferred to your hotel. After some time to relax from your flight you will meet your guide who will provide a briefing. During this briefing they will take you through the planned route and carry out an equipment check to ensure you have everything you need to enable you to enjoy your trip. Trekking Day 1: Start your ascent of Mt Kilimanjaro. Departure from the hotel after breakfast. 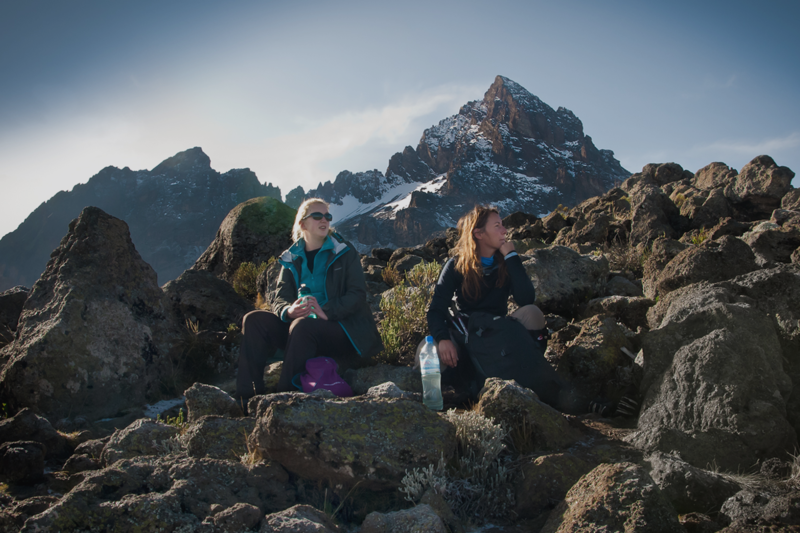 Transfer to the Machame Park Gate and hike up to Machame Camp at 3,000m. Approximately 3-4 hours walking. Trekking Day 2: Follow the trail up through giant heathers and moorland. The trail eventually becomes rocky and you will reach the Shira Camp at 3840m. The trek will take 4 - 5 hours. Trekking Day 3: Head east up towards the Lava Tower gaining dramatic views of the Breach Wall precipices. Shortly after the trail descends into the Barranco campsite, at 3,950m (6 - 7 hours). 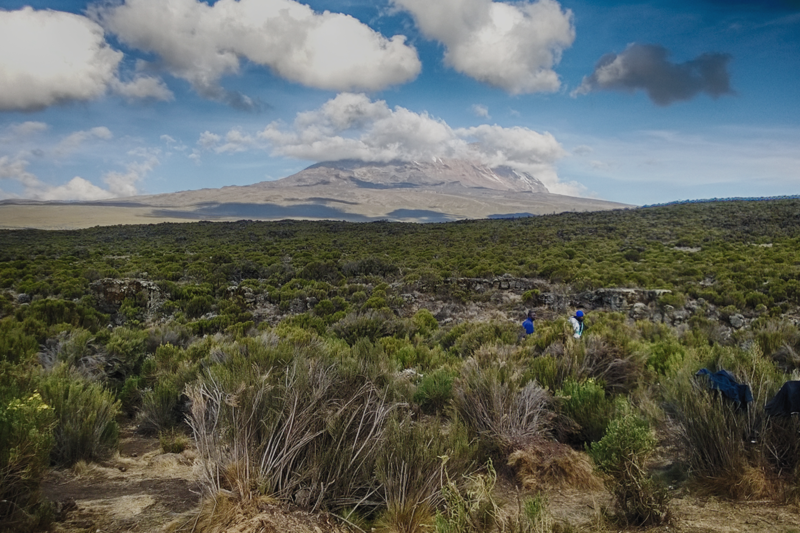 Trekking Day 4: An easy scramble leads to the top of the Great Barranco, you will then traverse ridges and screes across to the Karanga Valley campsite at 3,963m this should take around 4 - 5 hours. The campsite is situated below the Southern glacier icefalls. Trekking Day 5: Trek up the access ridge to the Barafu Hut for the night located at 4600m. Having almost completed your acclimatisation this is the point from which you will head for the summit of Uhuru peak. On arrival at camp you will prepare your equipment for your summit walk in the morning. Trekking Day 6: Summit Day! Just after midnight you will start your ascent, climbing the screes to Stella Point at 5,725m. 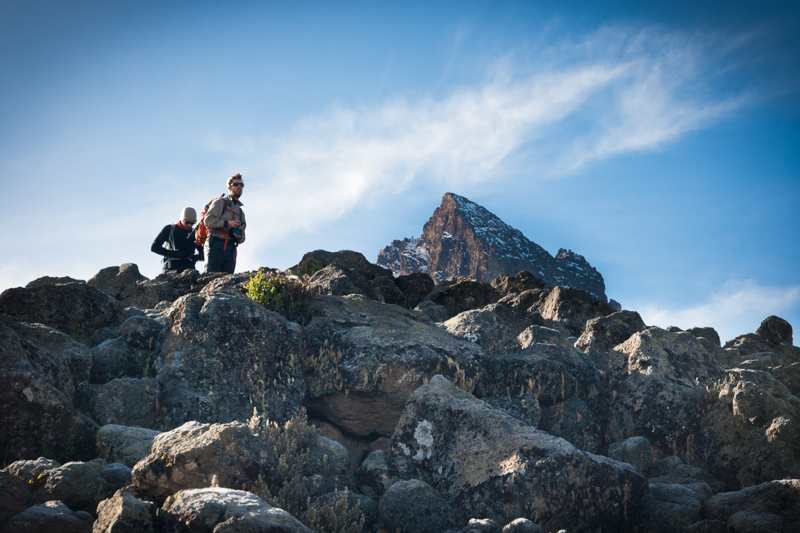 On to Uhuru Peak and the completion of your climb! You will descend back to Barafu Hut for a rest and food then on to Mweka Hut where you will camp for the night after a lengthy 11 - 14 hour day of walking..
Trekking Day 7: Returning back to Mweka Gate you will be met by your driver and returned to your hotel. Departure Day: Head back out to the airport and say goodbye to Africa! Our services end. Most flights to UK will arrive the next day. Please note: This itinerary is a guide only. It can be subject to change dependent upon viability, course members' fitness, weather conditions or any other reason the guide may deem necessary. This trip involves travel to high altitudes and to areas where a short notice change of itinerary may be necessary. Pay a £499 deposit and confirm with your charity their minimum fundraising requirements for the balance. This will typically be double the cost of the adventure, less the registration fee. You can join any of our open Kilimanjaro Ascents, just select the date of your choice opposite and enter the name of your chosen charity in the group/charity section. For more details of how fundraising works please read our step by step guide here or contact us for help. Porters' Tips - Africa has a strong tipping culture and your porters will expect a tip at the end of your trip. This usually works out at approximately £100 in US dollars (notes). We run the Kilimanjaro Ascent - Machame as a bespoke event. We can run this trip for one or more bookings. For best weather conditions we run this course anytime during July, August and September as well as mid December through until the end of February. The listed dates are 'in country' service provision dates and do not include time required for travel to and from this event. Please see our itinerary and factor in your travel time to/from Tanzania when planning your trip. To book any number of participants on to an event, simply select the date in the calendar and follow the booking procedure. You will then receive an automated confirmation and full details will follow from our office in due course.